Is there coming a time of universal restoration and reconciliation in which all things will be restored? The author believes there will come such a time and shows just how he believes this will be done in the future. The author takes issue with those who teach and preach about a place called "hell" where those who reject Christ will spend eternity in abject misery and torment forever suffering the terrible agony of a fire that will not and cannot be quenched. Pastor Hawtin believes that the Scriptures really teach that there is coming a time of universal restoration and reconciliation in which all things will be restored whether they be things in heaven, things in earth, or things under the earth? Many Christians fail to realize that no translation of the holy scripture is inspired. Only the original writings by the apostles and the prophets were inspired. Since then the original writing was done in Hebrew for the Old Testament and Greek for the New Testament all translating into the multitudes of other languages has had to be done by learned scholars of Greek and Hebrew and these for the most part have done a masterful work." Because of this it stands to reason there will be certain instances where the Bible may seem inconsistent at times. And to deal with this problem Hawtin suggests that "everyone who considers himself a student of God's word should . . . Purchase a good concordance such as Young's or Strong's and learn how to use it". Pastor Hawtin goes to great lengths and in great detail to explain the true meaning of the words hell fire, brimstone, eternal, everlasting, for ever and ever, the second death and others in order to show how these words have been misunderstood by most Christians for centuries. 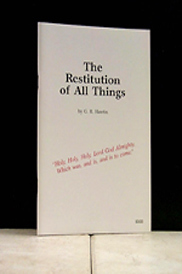 Once the proper translation from Hebrew and Greek to English is applied the reader gains a completely different concept than that which he has always been taught regarding God's purpose towards man and His creation and is then able to see more clearly God's wonderful plan for The Restitution of all Things.